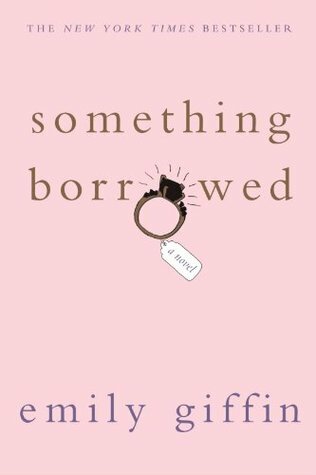 Something Borrowed has an attention-grabbing premise and is very well written. As a result, I wanted to keep reading even though the main character and her best friend annoyed me. Here’s the gist of the story. On the night of Rachel’s thirtieth birthday party (which her best friend Darcy planned), she sleeps with Darcy’s fiance (Dex). But here’s the thing, Rachel was friends with Dex long before he even knew Darcy, and she’s the one who set the couple up. To make matters worse, Rachel realizes that she actually has feelings for Dex and vice versa. At first, I was angry with Rachel for doing such an unforgivable thing to her best friend, but then Griffin reveals little by little what a poor excuse for a best friend Darcy really is. After learning about the pitfalls of their friendship, I no longer felt all that bad for Darcy, yet I continued to have lukewarm feelings for Rachel because of what she’d done. As a result, this book had my chest in knots because I just didn’t know who to root for! In short, I have no real faith in my own happiness. And then there is Darcy. She is a woman who believes that things should fall into her lap, and consequently, they do. They always have. She wins because she expects to win. I do not expect to get what I want, so I don’t. And I don’t even try. I couldn’t understand how Rachel put up with Darcy for so many years. Nor could I understand how someone could do what she did to her best friend. Yet, I was compelled to find out how everything turns out! Let’s just say I have a love/hate relationship with this book. Love the concept. Couldn’t stand the main female characters for the most part. Something just isn’t right when you’re dying for the heroine to get what’s coming to her, but at the same time, you don’t much care for the other key players either! I like to have someone to cheer for when I’m reading too. I found Gone Girl frustrating for that reason.